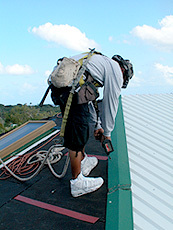 Rooftops of St. Croix, providing roofing to Virgin Island home and building owners since 1970. We combine the latest and most advanced roofing skills, technologies, materials, and workmanship with exceptional customer service. We never cut corners and the results are evident in every finished product. Our roofing products are always custom fabricated to order, which ensures a precise fit every time. Rooftops craftsmen use time tested methods to ensure a long lasting product. Rooftops has extensive experience and expertise in all facets of roofing and many other construction disciplines. Briefs, evaluations and estimates are available as part of our consulting services. Writtin briefs are available for each project, providing condensed information about current conditions of the roof, roof deck, penetrations and adjoining walls. Comprehensive written evaluations and long-term planning are free services provided by Rooftops. Written estimates are available on all projects. All written estimates are based upon an agreed upon scope of work, and are good for 60 days. 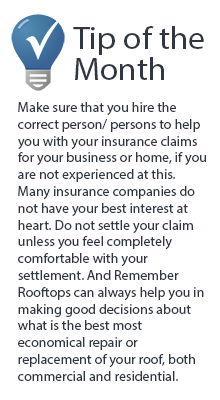 After you sign the contract, Rooftops prides itself on no change orders, unless brought forward by you. We deliver our services for the contracted amount, with no surprises. CALL US FOR A FREE CONSULTATION AT 340 778-8550 or fill out our online Consultation / Estimate Request form here. Rooftops operates two portable roll formers that can form Standing Seam Metal Panels directly at the job site allowing the flexibility to correct errors or customize the panels. The greatest advantage of on-site metal roof manufacturing is that panels can be created in the exact length they’re needed — and when they’re needed! Having exact length panels eliminates lateral seams that can compromise a metal roof’s eye appeal, and it eliminates a source for possible leakage. On-site manufacturing is not only a cost effective way to go, but it also means there is no damage from shipping or packaging. If a panel does get damaged we can create a new one instantly without delaying the job! Custom-Made Accessories for Standing Seam Metal Roofing Unlike many of our competitors, Rooftops custom makes most of the accessories for your metal roof out of the same metal as your roof—things like edges (metal edge), ridges, valleys, and other miscellaneous flashings that particular applications require. Because accessories and how they’re made play an important role in the quality of your roofing job, we spend a lot of time in our metal shop fabricating your flashings and accessories before even coming onto your job site! Both commercial and residential roofing are significant investments and because of this your roof needs to not only look good, but protect your home or business for many years. How do you know what roofing solution is right for you — and who can you trust for a quality job? What can you do to reinforce your roof and increase its capacity to withstand the ever increasing ferocity of today’s hurricanes? What are the most environmentally friendly roofing choices you can make? 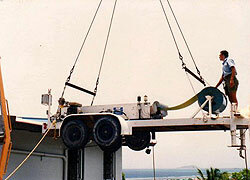 In the Caribbean, roofing that’s done right with quality materials plays a big role in reducing air conditioning costs. Rooftops installs only roofing materials that we can confidently warranty. Additionally, we provide you with the other services needed to ensure that your roofing choice is the right one — a long-lasting company, friendly office assistance, a planning partner, proper liability insurance and capable craftsmen! Rooftops has been roofing Virgin Island homes and businesses for over 40 years, so you know we’ll be there to back up our work. Let our Project Planners assist you in selecting the roof style that’s right for your application and needs. CALL US FOR A FREE CONSULTATION AT 340 778-8550 or fill out our online Consultation Request form here. Even if you’re not experiencing specific problems, you might decide to re-roof your home. Maybe a neighbor’s reroofing job has impressed you, or maybe you’re simply trying to give your house a face-lift. Thinking about giving your home a makeover? A new roof from Rooftops provides an opportunity to give your home a distinctive look, as well as superior protection with a Five Year Warranty. A leak, of course, is the most obvious clue that your roof needs some attention. Leaks can be caused by a variety of reasons, such as improperly installed or deteriorated flashing. Tree limbs rubbing against your roof can create a leak, as can old caulking around vent pipes that penetrate the roof. The faster you take care of roof repair, the better. In the Caribbean, roof repair is especially important because our heat and humidity can promote the growth of mold and mildew. 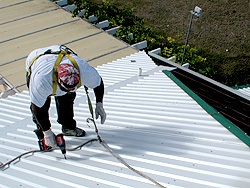 Rooftops can perform complete installation of all their products throughout the Virgin Islands. We have completed many large-scale gutter installations at parks, hotels, resorts and at many fine homes in St. Croix, St. Thomas and St. John as well. Rooftops V I’s roof consultants and roofing engineers can deliver commercial roof design & roof restoration services for waterproofing your roof system. Whether your roof system is a project for maintenance, repair, restoration, or replacement, Rooftops V I’s roof engineers and consultants can design the solution to ensuring watertight integrity of your roof system. We emphasize strict adherence to quality throughout the project, ensuring that you receive the highest return on investment. "My experiences with Rooftops have all been positive. I have no regrets in my decision to use them for my roof, and I highly recommend them!."